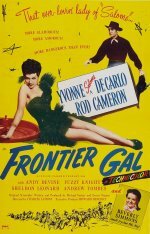 Released in the UK as The Bride Wasn't Willing, this romantic western was one of the movies that made a star out of exotic lovely Yvonne De Carlo. Tight-lipped leading man Rod Cameron is De Carlo's rugged co-star, and the splendidly batty plot involves bandit Cameron marrying De Carlo and going on the run for six years, then returning to discover that he's now a father before ultimately throwing the villain over a cliff. Don't ask. The roles were originally intended for the equally exotic Maria Montez and bland Jon Hall, but De Carlo (looking glorious in 1940s Technicolor) and Cameron are marginally more watchable, if less showy. De Carlo would gain icon status in The Munsters TV series, but Cameron was relegated to B-westerns, despite success in three syndicated TV shows. Comedy western starring Yvonne De Carlo. Saloon owner Lorena Dumont falls in love with a fugitive and forces him into marriage, only to turn him over to the law. But he escapes, and after six years on the run he returns to discover that he has a daughter, who intends to reunite her parents.